HOLIDAY SPECIAL! - Bob Baldwin (2016) "The Gift of Christmas" - FULL ALBUM w/ Download for only 13.99 (Free Shipping)! Bob Baldwin (2016) "The Brazilian-American Soundtrack" (26 songs) - FULL CD + Download for only $14.99 - f/ Marion Meadows, Zoiea, Torcuato Mariano, Leo Gandelman, Ragan Whiteside, Gigi, Marlon McClain and more. 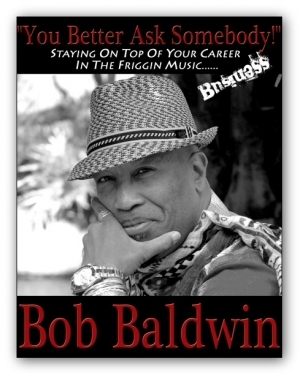 Bob Baldwin (2015) "MelloWonder / Songs in the Key" CD and MP3 CD Download - A CSI Exclusive for 11.99 - f/ Marion Meadows, Ryan Kilgore, U-Nam, Chieli Minucci, Toni Redd, Stanley Thompson and more. BOB BALDWIN - "MELLOWONDER / SONGS IN THE KEY OF STEVIE"
Bob Baldwin (2009) - "Lookin' Back" CD + Full MP3 Download & 19 Free Ringtones - SPECIALLY PRICED FOR 13.99! - Features Marion Meadows, Tom Browne, Noel Pointer, Cafe Da Silva and more..
"You Better Ask Somebody! Staying On Top Of Your Career in the Friggin' Music Business" is a music handbook that primarily helps prepare aspiring musicians to create a successful career in the music industry. The handbook, created for high school and college level students, explains how aspiring musicians can create a successful career path and make a name in the industry while maintaining their integrity. It's also a refresher course for veteran artists and a manager's reference guide to improve their own work ethic.